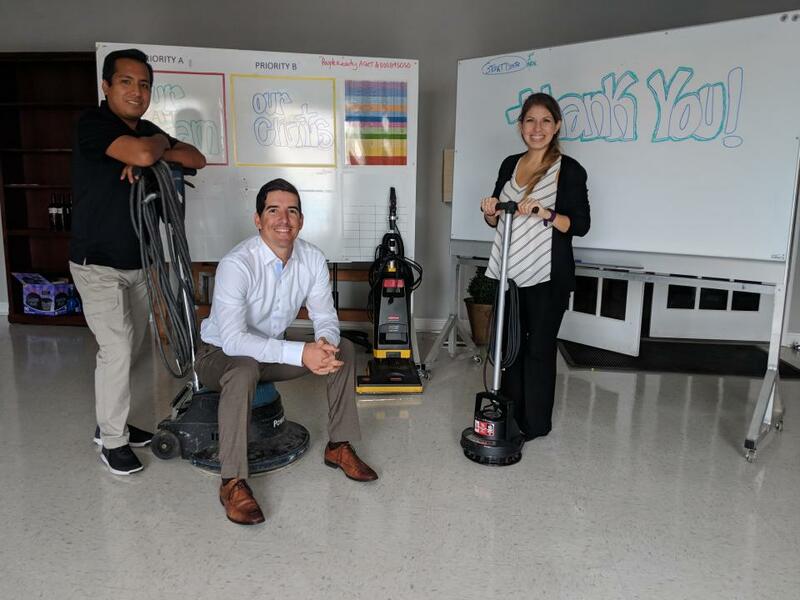 A loan of $10,000 helped us provide the equipment and education/training necessary to empower our Squeaky Clean team, as well as thrive by becoming independent leaders. I am from Venezuela. I came here to the States at 19 to live the dream. I Was in high school while cleaning gyms at night with my uncle. We were employees to someone who did not really care or treat us fair. There was no training or any culture. I cleaned seven days a week for 6 years. Being an undocumented immigrant at the time limited my options. However I always took pride in my job "Always wondered why this industry is ran so poorly being a billion dollar industry". One day we met a woman who owned a Master Franchising Commercial Cleaning. We bought a $8k franchise with them and slowly became independent. Then, we had our own employees and could create our own way of doing business(with restrictions). As our business grew, I took care of the training for all our employees. Then, the time came for me to leave the business and move to another state to pursue my wife's career opportunity. I always kept in mind how I wanted to have my own business in this industry but was not sure how to structure it. Chattanooga community inspired me and several years later we are here today finally daring to make the project our reality, change people's lives and make a dent in the industry. I do this for my family, my kids and the people in the industry who deserve better. The dream is to be an example in this industry and promote change within it. My wife/partner is the base of this foundation. Without her support I would not be here today. Our passion and determination is key. It helps an ambitious entrepreneur kick start his cleaning business. Our family owned business is for Cleaning/Maintenance of Floors/Carpets in Chattanooga TN. My wife is from Peru, I am from Venezuela, and as minorities we are constantly looking for progress. Coming from a background in the industry for 14 years, starting all the way in the bottom working for someone cleaning gyms to running a commercial cleaning company. The dream for the Squeaky Clean is for it to be ran with a project within. My wife and I have worked in customer service for many years and are primarily focused on making our name succeed based on Customer Service and our inner team building. The current industry fits a mold that has been the same for decades. Change starts within and organically it will reflect outward. The cleaning industry has always been unknown and looked down upon. We want to change that! Break the mold and be fun, interactive, culture driven, inclusive, new and different. We want to be part and be known by our community even if you do not use/need our service. By empowering minorities, refugees and individuals wanting to thrive in this industry and be part of a culture change to this industry. Our team will get the tools and knowledge to be independent leaders in the business. We will set apart for many reasons and will be successful only because our team members will be treated with the respect and attention any human being deserves. Our team will be dignified and proud of the business they are in and the business they will lead. Our goals are to be known for our culture. Successful in the way we do business. Dignified in our presentation. Squeaky Clean is a floor cleaning/maintenance company driven by a passionate project designed to help minorities like myself earn the training and tools necessary to thrive within this industry. With the correct training and education we will empower our Team to become independent dignified leaders. Through this project the goal is to change the culture of the cleaning industry, how it is viewed and how it is ran. These purchases will kick start our business. Once we are able to have the right equipment and tools, our revenue will start increasing toward our goal minimum of $50,000 (2018-2019). We know this Kiva loan will have tremendous impact because it will give our team even more confidence that there are believers out there that support our goal. The loan will help us start reaching our goals. We feel this opportunity will impact my life and my family because we will be able to give strength and help to individuals trying to make something for themselves. We will be able to empower peoples lives and methods of earning their living with dignity. The loan will only push us harder to achieve this culture change. Why are you endorsing Luis? Luis is currently participating in our CO.STARTERS cohort in collaboration with LaPaz. He brings such an energy everywhere he goes and is always looking for innovative ways to better his community. We're excited to see the impact Luis and the Squeaky Clean team will have on their industry and the people working with them!